Chapter 6: Denny Shute and the "Maker of Champions"
Lloyd Gullickson's resignation after the 1926 season necessitated the search for a new golf professional. The opening attracted 200 applications. On January 20 1927, Elks' Country Club announced the hiring of Herman Shute, most recently the pro at Spring Valley Country Club in Huntington, West Virginia. 49 year old Shute, like Scioto's pro George Sargent, had come to America from England in 1901. Like many of the old pros who emigrated from the old sod, Herman was an accomplished club maker. It was also noted in the announcement that Herman's 22 year old son Densmore, "has twice been amateur champion of West Virginia." However, it would have been natural for local golf pundits to question whether triumphs in the less golf-developed "Mountain State" would translate to success for Denny in hotly competitive Columbus. Would he even win The Elks' club championship? Quiet reserved Denny made an immediate splash by setting the amateur course record at Elks'. All who watched him were impressed with his Fred Couples like "swing easy- hit hard" style. He raised eyebrows further in mid-June by qualifying along with pros Charlie Lorms and George Sargent for the upcoming U.S. Open. He was just getting started. The week following the Open qualifier found Denny competing at Walnut Cliffs in the Columbus District Golf Association championship tournament. With only one close call, Shute cruised through his matches to the 36 hole final. Perhaps emulating movie star Ronald Colman, Denny sported a trim mustache when facing Scioto's E. Cutler Dawes. Shute won easily 8 and 7. However, his victory took a backseat to another headliner, Charles Lindbergh, who was being feted in New York upon his return from France. After receiving the "Dispatch Trophy" for his District Amateur win, Denny motored east to Wheeling where he spent the night en route to the U.S. Open which was to start Thursday at Pittsburgh's Oakmont. Oakmont, then as now, was an extraordinarily difficult test. The "Silver Scot" Tommy Armour wound up the winner with an inflated tally of 301! Denny did not break 80, but the course was so brutal that his 325 total still brought him a T-48 finish in his first foray on a national stage. He finished fifth low amateur (low am was always the property of Bobby Jones). Low Columbus player honors went to 45 year old George Sargent, who outdid Denny by three shots. After his Saturday finish in Pittsburgh, Denny had no time to rest on his laurels. He raced to Dayton to compete in the Ohio Amateur at Miami Valley Country Club. It would have been understandable had he sagged some after this whirlwind of pressure-filled competitive golf. But Denny stayed focused, and his amazing run continued with a win over Sinclair Dean in the event's final match. Shute's victory marked the first state-wide championship won by a Columbus- based player. It would not be the last! 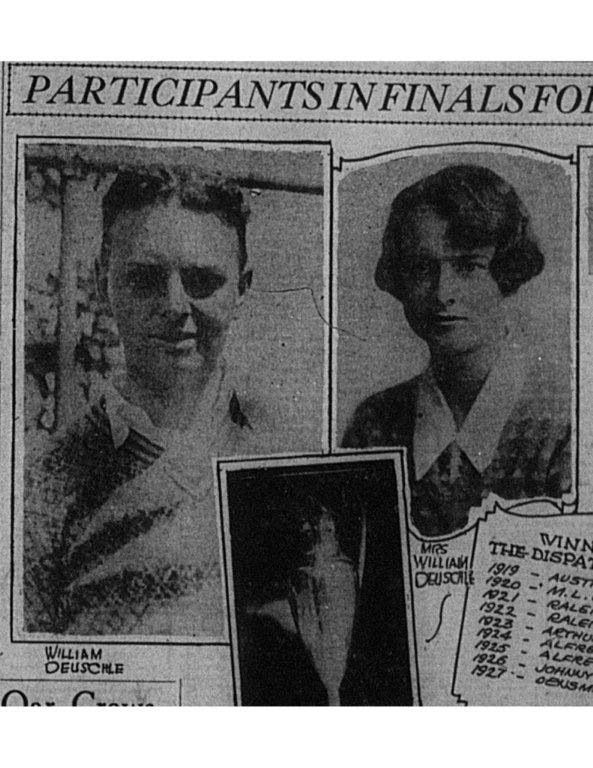 Other Elks' players would validate Denny's triumph with their own victories in the state amateur. There was a harbinger of this coming success in the Elks' team's victory at the 1927 CDGA team championship. The Elks' team of Denny, Bill Deuschle, Bob Albright, and F.C. Eickmeyer stormed to the title at Walnut Cliffs by nine shots over Scioto! 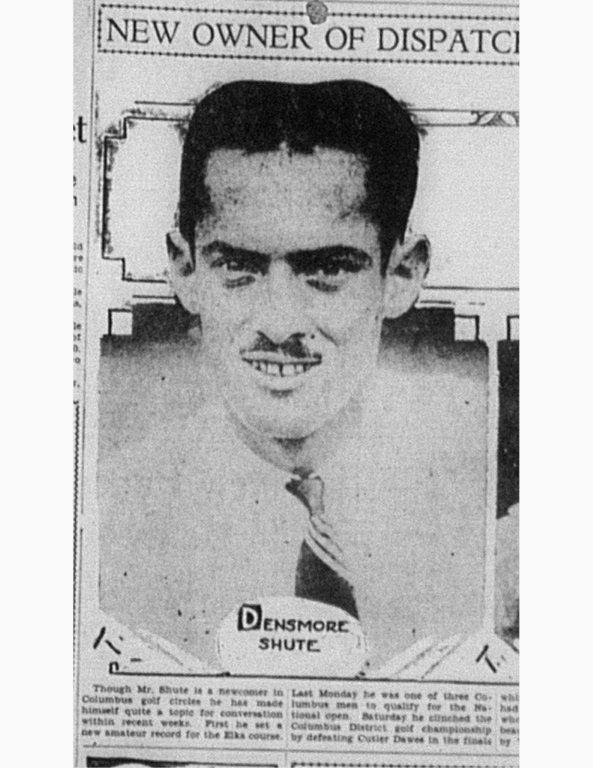 Having dominated the amateurs, Shute entered the professional ranks at the close of the 1927 season to gauge his capability of competing with the likes of Tommy Armour, Walter Hagen, and Gene Sarazen. But his great golf at The Elks' was not over. In August, 1928, Denny fired what the press deemed a "miracle" round of 62 over his old home course. Shute's course record would never be equaled. With Denny Shute gone from the scene of Ohio amateur golf, another Elks' stalwart stepped up in 1928. Bill Deuschle was well-regarded in local golf circles. He had come close to carrying off district honors several times while an Elks' member. Bill switched his membership over to Arlington Golf Club just prior to entering the '28 District championship at Scioto. Things went well for Bill at Scioto as he vanquished every opponent en route to the final. His victims included Alfred Sargent (George's son), and talented high schooler Johnny Florio. Furthermore, his wife Martha had likewise made it to the final of the Ladies' Franklin County Amateur. Unfortunately, both final matches went poorly for Mr. and Mrs. Deuschle. Bill's game went dreadfully awry in the last match against Raleigh W. Lee, who was advantaged by competing on his home course. After a woeful 84 in the morning round, Deuschle found himself buried 5 down to Lee. He played better in the afternoon, but was still soundly trounced 5 and 3. Martha, however, salvaged some family pride by coming home a winner. Frustrated by another near-miss, Bill resolved to give it another go in the '28 Ohio Amateur at Youngstown C.C. (yet another Ross design). He again played beautifully all the way to the final where he was matched against four-time state amateur champion Harold Weber of Toledo. This time, it was Deuschle who emerged from the morning with a 5 up lead. It appeared that Bill might let another title slip away when Weber cut the lead to two after 23 holes. But Weber's rally sputtered, and Deuschle won a close, albeit spottily played, final 2 and 1. While the James M. Cox trophy technically traveled down the road to Arlington, a piece of it surely belonged at the Elks'. The club members took great pride in the knowledge that a second Elks'- honed player had become the state amateur champion. An Elks' junior member claimed the club's third straight Ohio Amateur in 1929 at Canton Brookside. However, this victory could not be categorized as a total surprise. Great things had been predicted for Johnny Florio since 1926 when, still a schoolboy, he claimed the Columbus district amateur title. He followed up that success with four municipal championships and a semifinal appearance in the U.S. Publinx tournament in '28 prior to joining The Elks'. Johnny, one of fifteen children, and blessed with natural athletic ability, starred in football, basketball, and baseball at Columbus's West High. But golf was his first love, and he immersed himself in the game, playing and caddying every chance he could. He became such a sought after looper that he toted for the likes of Bobby Jones, Walter Hagen, and Gene Sarazen in prestigious events like the Open, U.S. Amateur and PGA. Johnny closely observed these great players. It was said that his swing carbon-copied that of Sarazen, who like Johnny was born of Italian immigrants. By the time he joined The Elks' in '29, young Johnny was already a seasoned campaigner with plenty of tournament experience. Florio confidently breezed through the field at Canton Brookside. Sparked by a holed bunker shot, Johnny defeated Cincinnati's Neil Remsick in the final match 4 and 3. Now golf writers across the state took note of the fact that Florio's victory was the third consecutive win in the Ohio Amateur by three different Elks' golfers! 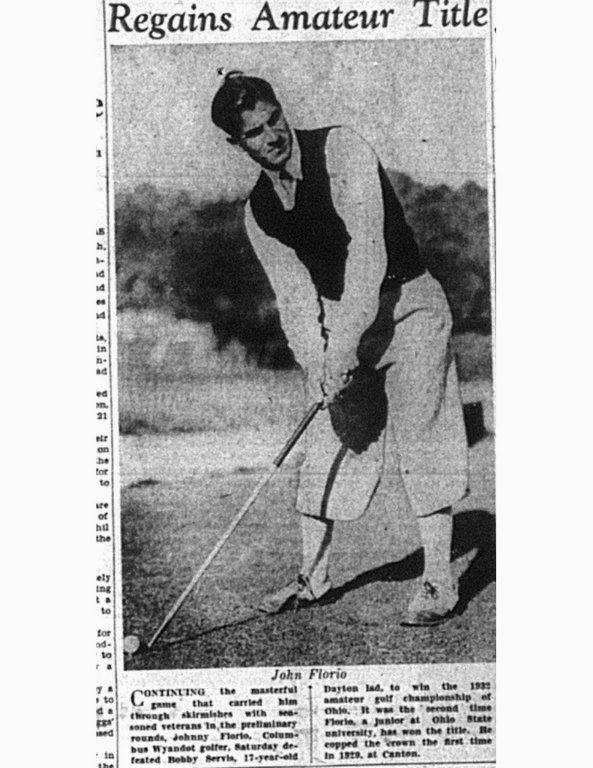 When the 1930 Ohio Amateur at Toledo Country Club rolled around, Johnny Florio led a contingent of six Elks' golfers northward. Johnny was favored to make it four consecutive Elks' winners. But, hampered by an infection in his left forearm, Florio was dispatched in the third round. It appeared that that the Elks' streak surely would end. However, one of the lesser-known of the club's better players kept hopes alive by somehow golfing his ball into the semis. Glen Bishop , a 26 year old clerk for the Ohio Auto Club making his first appearance in a noteworthy event, was fortunate to qualify for match play. Glen himself wondered whether he was being foolhardy to journey to Toledo for the event. He did not think he had any chance to win and he could "hardly spare the time or money necessary to make the trip." But Bishop, playing brilliantly, manufactured one upset after another! His victims included the previous year's runner-up Neil Ransick as well as Nelson Ruddy, the 1929 medalist. The press suddenly realized that Bishop was playing as well as anyone, having recorded solid rounds of 75-72-73 in his victories. In the semis he faced Raleigh Lee, the 1928 Columbus District Amateur champion, and many time contender for state honors. Surely Glen's joyride would end! But instead, he stayed hot garnering another surprise victory 3 and 2. Amazingly, Glen Bishop had played his way into the final. His opponent would be a young Toledo insurance salesman Ray Miller, who would have the advantage of hometown support. The combination of a showdown featuring a complete unknown against a local hero drew 1000 spectators to the final. Glen started slowly, and found himself 3 down after 13. But by winning three of the last five holes of the morning round, he squared the match heading to lunch. The afternoon 18 was closely contested all the way. With the match dead even at the par 3 14th, Miller came up just short leaving a straightforward chip. Bishop put himself in serious trouble after an atrociously hooked mid-iron. His ball came to rest 40 yards from the hole in a road rut on "hard clay with a downhill lie and a knob just beside it," according to Dispatch reporter Lathop Mack. Glen asked the referee whether his ball was in a hazard, He was told it was not, but that he nevertheless would not be permitted to ground his club on the hardpan. In Mack's view, this was "a trifle ambiguous ruling." Facing what appeared to be certain loss of the hole, and the match's turning point, Bishop executed a pitch that would be remembered for years to come. Laying back the face of his niblick, Glen "scooped the ball well up and dropped on the green. it trickled up to within inches of the hole." Stunned by this improbable recovery and the accompanying reversal of fortunes, Miller came up short with his own chip and then missed the tying putt. Bishop was ahead for the first time! He nursed his one-up lead to 18 green where he stood shaking over a 12 incher for bogey 5 to close out the tournament. Upon holing it, Glen "dropped his club and turned around wearily to grasp Miller's outstretched hand." In a gesture of fine sportsmanship, Miller invited Bishop to play Ray's home club of Inverness the following day. The most unlikely of Elks' fine players had been the one to stretch the club's victory string to four! Just to illustrate the depth of fine players at The Elks', none of the club's vaunted Ohio Amateur champions made it to the finals of the club championship that year. Joe Outhwaite bested Stark Frambes in the 36 hole final. The Elks' Ohio Amateur victory string finally came to an end in 1931. But a second Johnny Florio victory in 1932 at Portage Country Club in Akron made it 5 out of 6 wins. As Lathop Mack put it, the James M. Cox trophy "was on its way back to its old shelf, to be gloated over by the members there for another year." The Elks' greens committee chairman Tom Dempsey told "The Citizen's Lew Byrer why The Elks' players enjoyed such tremendous tournament success. "The reason is simple enough. Our course is so designed that you have to shoot accurate golf to score well. It's accurate golf which wins. Players used to our course, lined on both sides by trees, ravines, and other troubles, find it comparatively easy to score on the more open courses over which most tournaments are played." Byrer's column further noted that "holes 1, 2, ,4, 5, 6 ,7, 8, 9, 11, 12, 13, 14, 15, 16, and 17 are lined on one or both sides by trees or out-of-bounds hazards designed to catch the wildly sliced or hooked tee shot... To score well over the Elks' course, you've got to stay down the middle or thereabouts all the time." While The Elks' men were piling up their skein of wins, a female player from the club also played great golf. 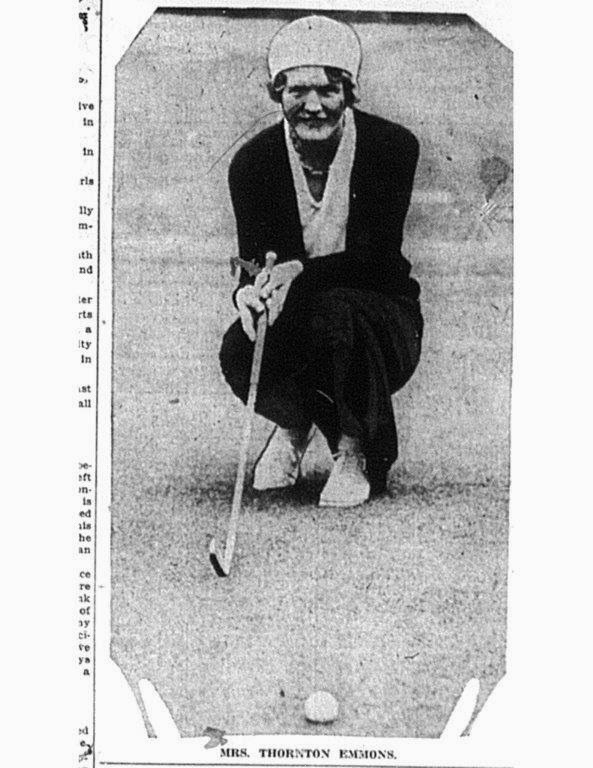 Mrs. Thornton Emmons, a championship tennis player, decided to concentrate on golf once she became a member. She immediately became a contender in the women's Franklin County Amateur. She finally broke through and took home that trophy in 1932. She captured the event a second time in 1934. Meanwhile, Denny Shute's pro career was cresting. While failing to post a win in his 1928 campaign, Denny demonstrated a hint of things to come with a stellar T-6 at the U.S. Open. In '29, he broke through with his first win in the Ohio Open. Denny really hit his stride in 1930 recording three wins at the Texas and Los Angeles Opens and a repeat triumph in the Ohio Open. Perhaps Denny had an unfair advantage in the latter triumph as it was staged at The Elks'! But the course held up very well to the onslaughts of Denny and his fellow pros. His winning score in windy weather was 287- an average of almost 72 per round. Anxious to capitalize on the success of its hometown boy, the Columbus Citizen picked Denny to author a golf tip column, "Shooting with Shute." His May 14, 1930 contribution stresses the need to relax in the face of adversity. 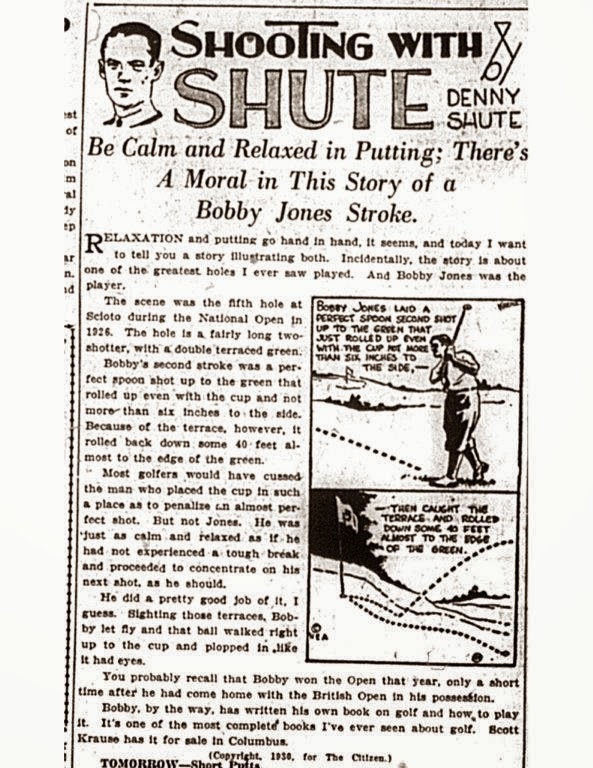 Denny cited Bobby Jones's calmness when a perfect spoon Jones struck to Scioto's 5th in the 1926 U.S. Open (won by Bobby) came within 6 inches of the hole, but then caught that green's devilish terraced slope and cruelly retreated back to the front edge. Most who have played Scioto have been victimized by that slope though few of us are precise enough to have hit the green with a spoon (three wood) as Jones did. A runner-up finish in the 1931 PGA Championship (played at match play until 1958) was just the first of his great performances in that tournament. 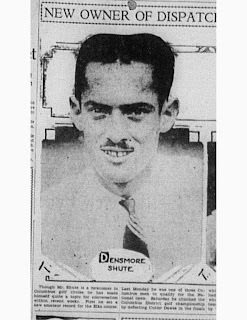 From 1933 to 1937, Denny Shute was arguably the best player in the world. No player matched Denny's three major championships victories during that span. In 1933, he took home the Open Championship at the "Home of Golf" St. Andrews on his first trip across the pond, besting fellow American Craig Wood in a 36 hole playoff. In '36 he displayed his growing dominance at match play by winning the PGA Championship at Ross's beloved Pinehurst Number 2 when he defeated the tour's longest driver, Jimmy Thompson 3-2 in the final. In the following year at the PGA, Shute rallied from a 2 down deficit with four holes to play to catch Jug McSpaden. He won the match on the 37th hole to win a second PGA at Pittsburgh Field Club. Denny was the last player to win two consecutive PGAs until Tiger Woods accomplished the feat over 60 years later. His match play success was no accident. The three-time Ryder Cupper's combination of down-the-middle shotmaking with an unruffled demeanor unnerved many an opponent. In all, Shute won 17 PGA tour events. His resume includes seven top tens in the U.S. Open. 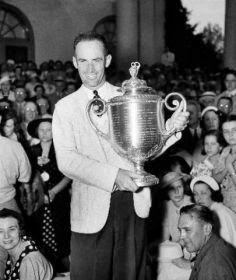 His high water mark in that event occurred in the 1941 championship at sweltering Colonial in Fort Worth where he finished runner-up to Craig Wood, who thereby gained a bit of revenge for his finals loss to Denny in the '37 PGA. Like his fellow competitors of the era, Denny kept a club affiliation to supplement the scanty purses available on tour. Upon turning professional, he was hired by York Temple- only a couple of miles north of The Elks'. In 1930, Shute moved over to Brookside Golf and Country Club to join his father Herman who had taken the club pro job there after the latter's short stint at The Elks'. Denny served as the club's "touring pro" while Herman manned the pro shop and gave most of the lessons. Thereafter Denny became something of a nomad, serving at a number of different clubs in different states (including Lake Forest Country Club in my hometown of Hudson, Ohio) until landing for good at Portage Country Club in Akron in 1945. 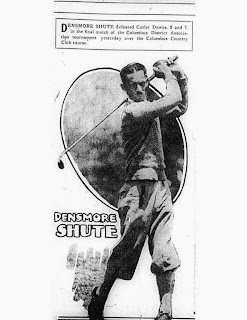 Denny Shute did not have occasion to golf much in Columbus until two tournaments in 1950. 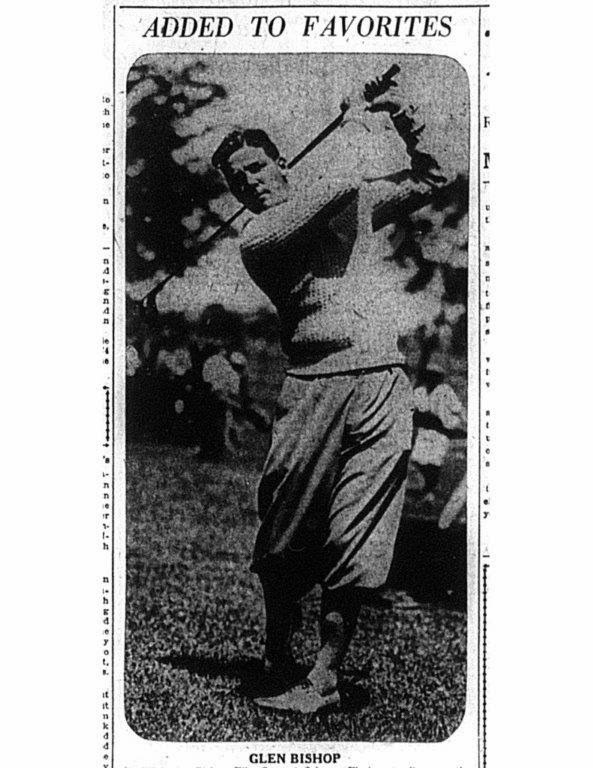 Denny entered the PGA at Scioto, hosting its first major championship since the 1926 United States Open. Now 45, and well past his prime, Shute had not been a factor in the event since the 30's. But he qualified for match play, won two matches, and made the round of 16 before bowing to Jimmy Demaret. Encouraged by his improved form, he signed up for a second Columbus event later in the summer- the Ohio Open at rain-soaked Brookside Golf and Country Club - a club Denny had served as pro 18 years before. Brandishing a hot putter, Denny was in the thick of things with a score of 140 through the first two rounds. Thursday's concluding double-round was mostly played in a downpour. While conditions were not ideal, they failed to deter Denny who was experiencing the ultimate in "sentimental journeys." 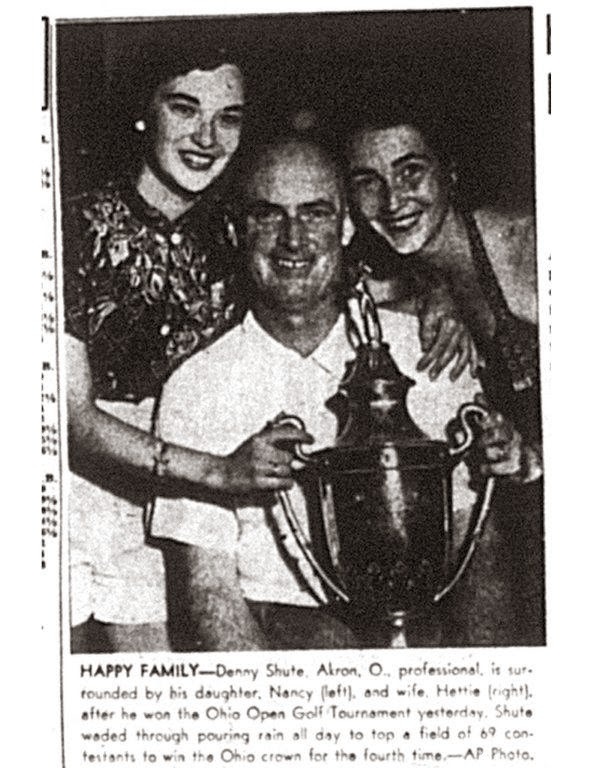 Accompanied in the drenching rain by wife Hettie (a Columbus girl who he married at St. John's Episcopal Church in Worthington in 1930) and daughter Nancy, Denny blitzed Brookside with a 67-69 finish. His sweet 50 yard pitch-in for eagle on hole 11 of the morning round kickstarted his blazing stretch run culminating in his fourth Ohio Open title. It was fitting that Shute's last big win took place in the same locale where he had launched his playing career. Unfortunately, the course at which his career really took off- The Elks' - was on life support by then. Years later, as Dispatch sportswriter Russ Needham was bemoaning the apparent imminent closing of Elks- Wyandot, he recalled that, "there was a time when Wyandot was called the 'maker of champions,' and there may have been something to the story. Its tree-lined fairways did demand straight shooting and, its small greens prescribed accuracy. Whatever it had, it produced champions year after year in the late 1920's. There was Denny Shute, Bill Deuschle, Johnny Florio, Glen Bishop and Mel Carpenter among the men, and of the women there was the late Mrs. Thornton Emmons, Mrs. Martha Deuschle, and more recently, Sally Elson, all of them champions." Unfortunately, two of Elks-Wyandot's Ohio Amateur champions, like the course which helped "make" them, met premature demises. Glen Bishop passed away in 1953 at the age of 53. His obituary noted that Glen had fought back from crippling arthritis which had left him bedridden for two years, but "had been playing in the '70's again at Brookside [which he joined after Wyandot closed] last summer." Dwight Watkins, a Brookside member since 1948 (and still consistently bettering his age of 88) remembers playing rounds with Glen Bishop. Dwight still uses a tip Glen imparted to him. "He told me, 'Dwight, always see the clubface hit the ball.' "
Johnny Florio died of a heart attack in 1966 at age 58. Winner of two district and state amateurs by age 24, Johnny ranks second to Denny Shute in the pantheon of Elks'-Wyandot's array of great players. This all-around athlete certainly possessed the talent to turn professional. Instead, he worked as an account executive for a Chicago athletic equipment firm while continuing to compete in state and local amateur events. Denny Shute continued as the professional at Portage in Akron until his retirement in 1972. Although his tournament appearances were infrequent, he continued to work on his game, and carded a 66 to match his age in 1971. One of the Portage members joked, "the only time you could get Denny to give you a lesson was if you were his partner and you were two down." Shute died in Akron in 1974 at the age of 69. He was elected to the World Golf Hall of Fame in 2008. Sam Snead paid tribute to Shute, acknowledging that, "if he had the fever to play tournament golf, he'd have been the equal to me." 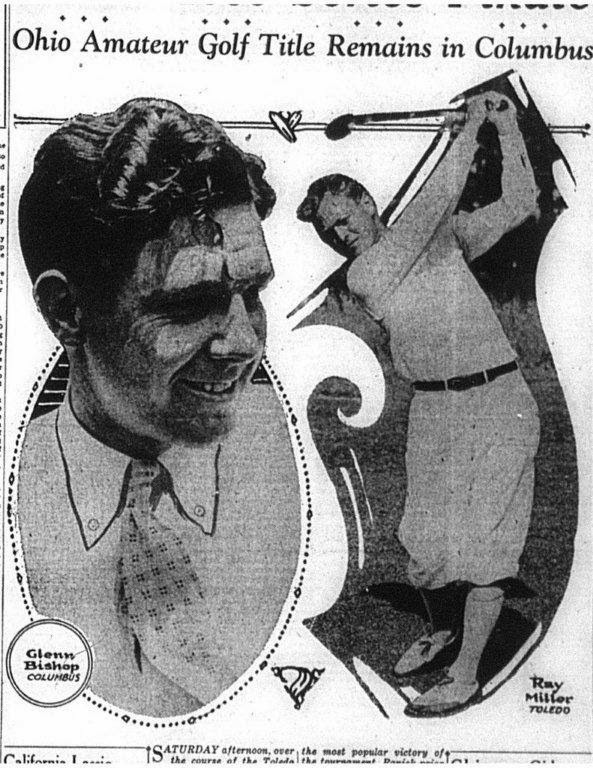 Denny Shute and his fellow Elks' stalwarts dominated the Ohio amateur golf scene in the 1927-32 time period in a fashion that was never duplicated by the members of any other club before or since. The "Roaring 20's" is often referred to as sports' "Golden Age." That designation certainly applied to the golf played at Elks' Country Club- the "Maker of Champions" in this halcyon period. Acknowledgments: Interview with Dwight Watkins; Ohio State's "The Lantern;" archives of Ohio State Journal, Columbus Citizen, Columbus Dispatch found at Columbus Metropolitan Library (special thanks to the Library's Jack Shaw); Golfweek Magazine, 2/26/2000; Golf News, Pinehurst Heritage, August 5, 2013- "Denny Shute- The Forgotten Champion."